Source: `Bhrigu Samhita'. Readings on Sri Sri Thakurji's horoscope. 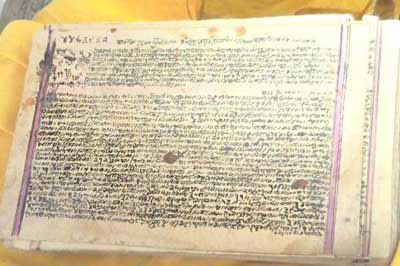 This `Bhrigu Samhita' ( after copying) was brought by Sushil Bose, on instructions from Sri Sri Thakurji, from the library of the King of Kashmir. He was born in his previous birth in a part of Bengal . He was dark-complexioned And was not of a tall height. He was uneducated but high-minded and `music & sound' was his favourite subject. He used to be chastised on this account by his parents. Achieving the highest knowledge he abandoned all expectations of earthly peace and happiness. He attained Paramhans-hood through acute sadhana (spiritual pursuits). There was no difference to him between iron & gold. He had no craving for earthly desires. He used to stay away from His parents & family. He had never, even in His dreams, thought of a woman & used to look at all women as mothers. In His sadhana (spiritual pursuits) of motherhood, He achieved siddhi. He used to stay surrounded by many disciples. Meditation. If His body touched gold or woman, His limbs used to feel acute piercing pain. He, at last, lost His strength and died of a disease of the throat. He was born again on earth to bring up and protect the disciples with care. He was born again to impart knowledge to His disciples & devotees. He comes back in the month of Bhadra for the sake of the knowledge of disciples. He is learned, reputed, rich & widely known. He is knower to His disciples with high reputation in many parts universally. He deals with `mantras', `Shabda-bhedi' ( one who can penetrate sound) and expert in uprooting `pisachas' (devils). He is soft spoken, higly learned, kind hearted & merciful. He is knower of Dharma ( eternal principles of life & growth), all scriptures & mathematical science. Though unread, He is knower of the scriptures, and speaks with accuracy about chemical sciences. He is possessed of high qualities, with attractive physical features. He is dignified with comforts of vehicles & carriers. He is Yogi of the highest order, being `Nad-siddha' ( controller of sound) & knower of Brahm ( the Supreme Being) and the Vedas. He has princely wealth and many many disciples. He shines in `Tapa' mediatation & wisdom and is the knower of the deep real meaning of the scriptures. If death comes, it will be on the wishes of the greatest Muni ( Sage) Himself. His death will be at His own will, whether its curtailed life or unlimited longevity. His rebirth has to come for the upliftment of creation, for the welfare of His disciples & to redeem the creatures, particularly the miserable sufferers. His advent takes place again in the family of His youngest son, for the glory of His mission. I am sorry to say but there has been some manupulation with the vrigu samhita's calculation regarding Sri Sri Thakur in this post which seems to me a propaganda to draw the attention of the Satsangi's towards the fals followers of the Lord, i gone throug two scripts on the refered subject in two diffrent books. I can firmly say that You peopls are nothing but a cheat. Stop misguideing peoples . Which book did you gone through. That vrigu samhita it you collected from market is not true itself. As original one is still kept in King of Kashmir's Library and our govt was unable to publish. 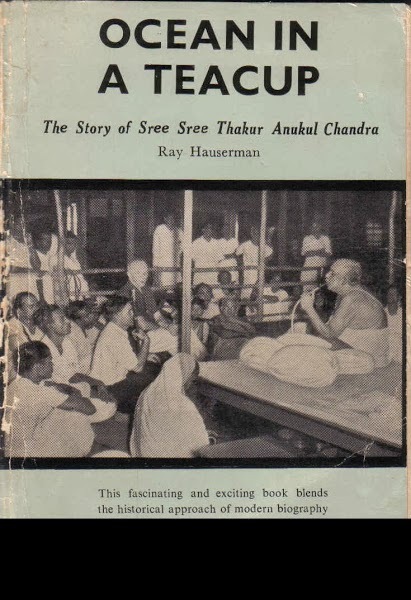 Sri sushil bose has copiied from original and came back to thakur. he himself has not broughT THE ORIGINAL ONE.